It seems that Visual Studio extent is bigger than we expect. Thanks. I have really missed this feature. I usually think of myself as a master debugger. A person that know all the tools, debugger extensions, etc. But I didn't know about this feature. You will get 5 points from me too. Very good information. I'm pretty sure that I will use this one quite soon. Thanks for sharing! You can use the same with them as well. I never mentioned it can only be used with VS 2010. You right, actually i don't meant that, my thought is nowadays kunal, brij & you are writing articles in VS 2010 but i'm still working with old versions . Some organizations still don't want to change in to new technologies & versions . That's what i want to mention here. But soon i'll change . Thanks for your reply. Pretty useful info here, AJ! Thanks very much Nish !!! You are welcome, and the article certainly deserved it. This application monitors for new posts in the Code Project forums. Nice explanation to track it. 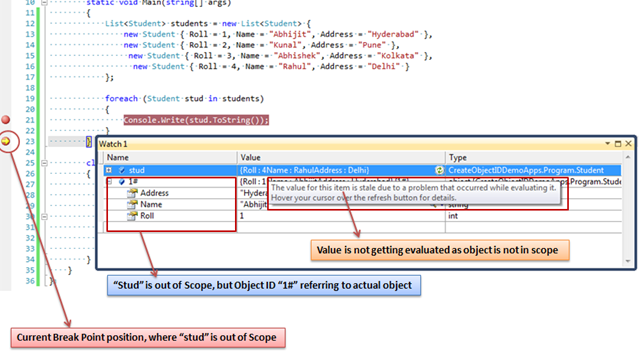 I am using VS2008 and In that I can also see the facility of 'Make Object ID' but I needs to rename object(1#), It is not being automatically renaming, and If I am not renaming that then forthcoming object value will be overridden to it and Stored object didn't appear. Or Is there improvement in VS2010 ? AFAIK, You can't rename them. This are the fixed ID generated by CLR Debugging Services which is used to uniquely identify the object. is not being automatically renaming, and If I am not renaming that then forthcoming object value will be overridden to it and Stored object didn't appear. Ok, Let you have my steps. 1. Hitting debug point and in watch I am adding stud object. am I missing something while performing operation?